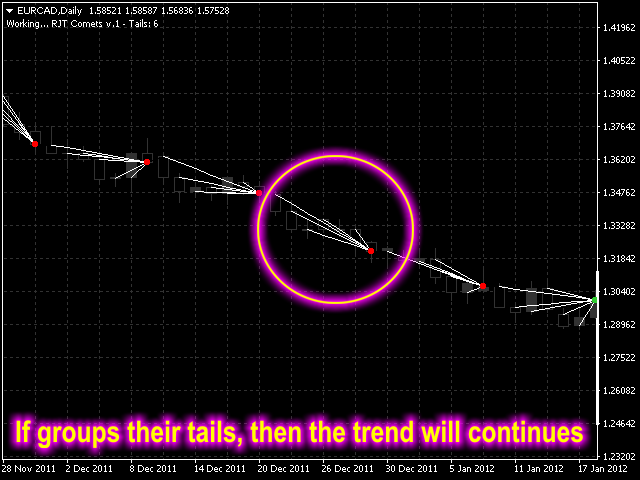 Follow the trail of the comet to know the development of the trend. 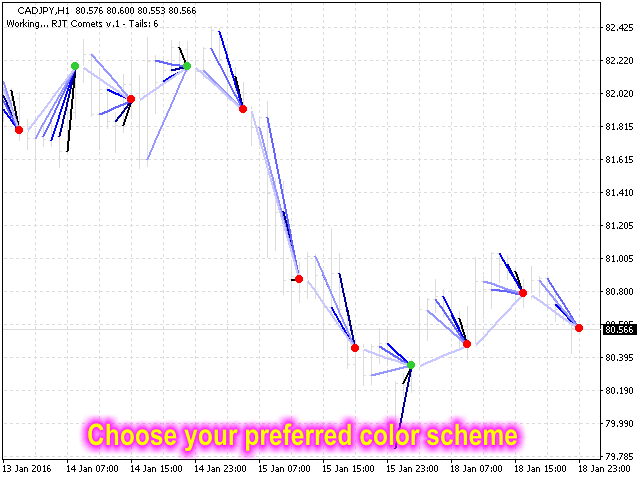 This indicator helps you to determine the evolution of the price depending on how these astronomical objects are shown in the chart. 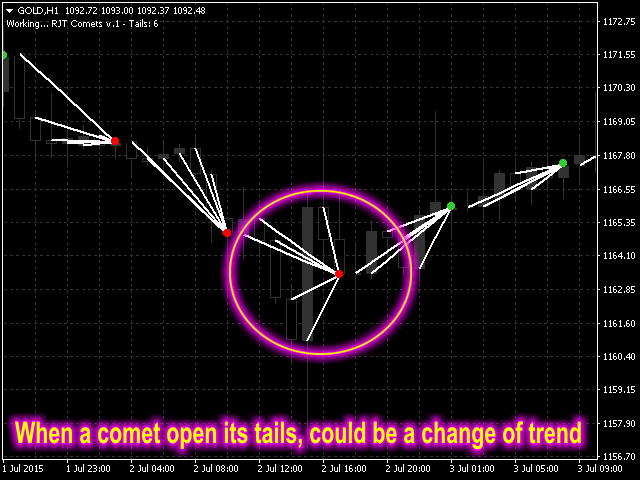 When the comet seems to stop, it opens its tails considerably and warns us of a possible change in trend. On the contrary, when it seems to get speed (looks thin because lines of tail are grouped) demonstrates safety and continuity in trend. 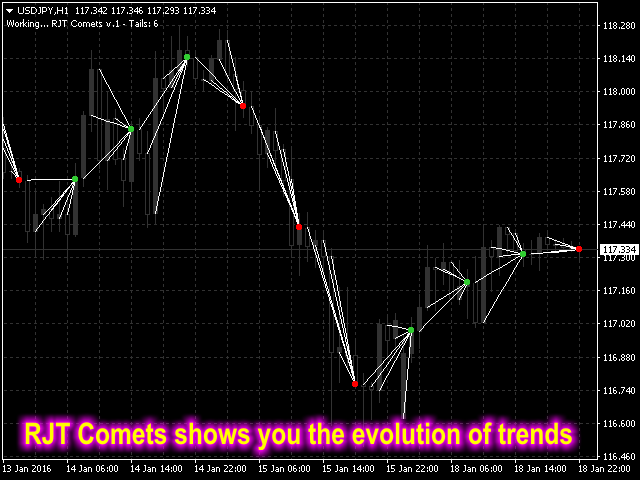 The head or comet nucleus will show red or green according to the level of its price regard the price of the tails. 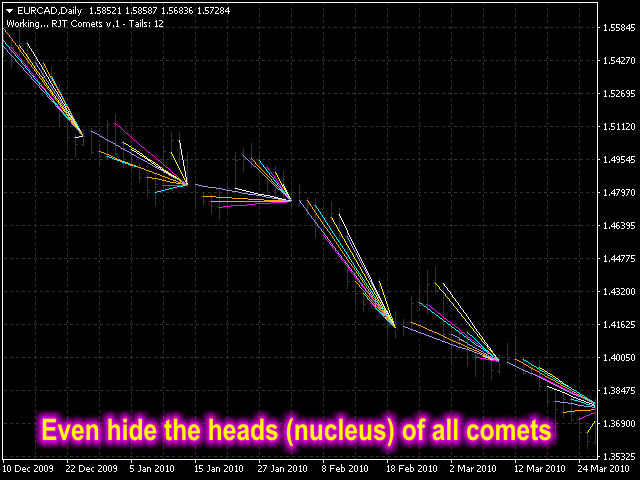 Each tail of the comet is a directrix between the closing price of the head or nucleus and the opening price of the previous bars. 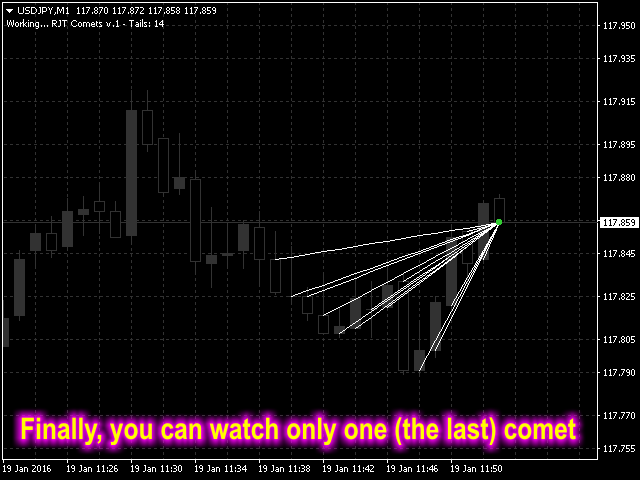 This indicator is valid for all symbols, all timeframes and it can adapt to any level of zoom. 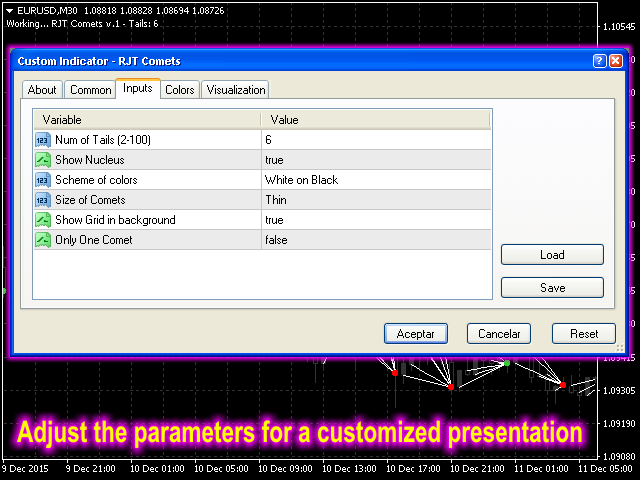 Show Nucleus - select if you want to show or hide the nucleus or comet heads. 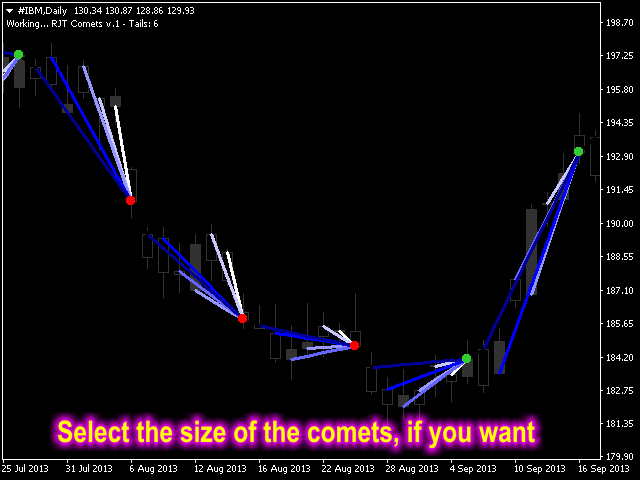 To clarify the visualization, you can hide the head of comets. Scheme of colors - all the variety of colors for the universe and the comets. 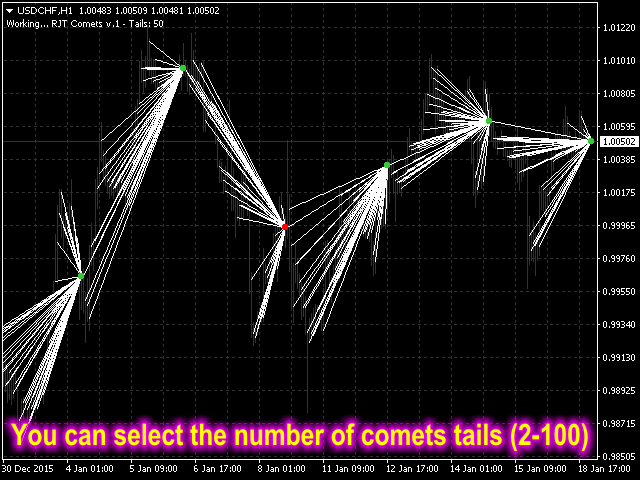 RJT Comets have several themes to represent the figures on the chart. Since the indicator overlaps the comets on bars/lines/candles, it needs this option to adapt the colors to improve visualization. Size of Comets - you can decide the dimensions of the heads and comets tails for the comets choosing from among Thin, Medium and Thick. 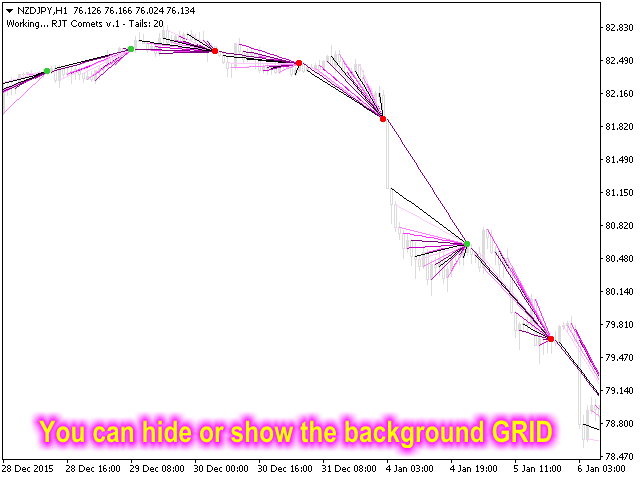 Show Grid in background - use this option If you want to hide the grid shown in background of chart.